Cloud computing is becoming increasingly popular. Technology is advancing at a fast pace and an increasing number of businesses are opting for cloud services. Cloud computing is simply servers, services, storage and software delivered over the Internet. Scalability: On-premise solutions can be hard to scale. The cloud enables instant scalability and scalability on-demand which is great for handling peak loads. Instantly available: With cloud computing, services are available immediately after you pay for it. There is no delay for setup or configuration etc. Economical: Since hardware in cloud computing is provided by the vendor, it eliminates the expense for the user who does not need to install, configure or maintain servers. Additionally, since some options in cloud computing work on the pay-as-you-go model, you only pay for resources you use. Security: Data backup is a key aspect of cloud computing. Through data mirroring, users’ data is stored across distinct servers on multiple drives so there is no concern about data loss. Performance: Cloud companies are equipped with high-performance computing infrastructure to guarantee low network latency. I like this analogy by rubygarage which compares cloud services to transport. Software as a Service (SaaS) refers to cloud-based applications. This is the most commonly used cloud model. Examples of SaaS products include G Suite by Google which allows for collaboration & calendering through Google Docs, Sheets and Google Calendar. Other examples include Office 365, Customer Relationship Management software, Salesforce, management tools, Trello etc. SaaS services are usually a subscription model. The hardware and software is provided by the vendor. All you need to do is login & get started. Who should opt for SaaS? SaaS products are great for any kind of business. G Suite is fantastic for collaboration & works well for teams. At ResellerClub we use G Suite for our email communication, to share content across teams & schedule meetings. We also use Trello to keep track of projects, update status on tasks etc. Tools and applications like these are useful for any kind of business, regardless of the nature of your business. SaaS is great for end users. Platform as a Service (PaaS) is the cloud computing model that provides platforms for testing, deployment, & managing applications. Examples of PaaS products include Google App Engine, Windows Azure, AWS Elastic Beanstalk etc. Like SaaS, PaaS also uses a subscription model of pricing. Provides platforms for a variety of services with development, deployment, testing etc. Who should opt for PaaS? PaaS products are for companies that have the intent to build the software, resources and time for the project but do not want to get involved in the technical part of the servers, the databases & the networks. PaaS solutions are great for software developers who wish to deploy or test applications without the related infrastructure. Infrastructure as a Service (IaaS) is the cloud service that provides basic computing infrastructure like storage, servers, networking resources etc. This service is useful to host websites, analyze data etc. as the user does not require to purchase and maintain vast private server rooms. IaaS uses Virtual Machines (VMs) to house data instead of physical servers. Who should opt for IaaS? IaaS is for those who require control over the infrastructure or the underlying hardware and software of the app they’re building. IaaS is for those who need increased security & higher customization. 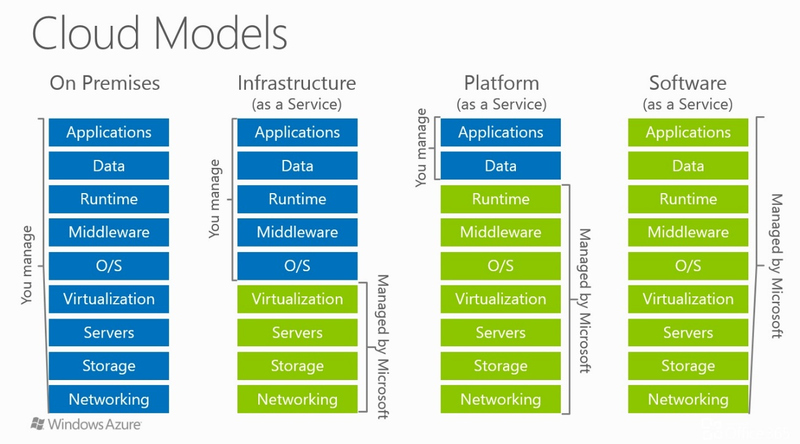 This chart by Microsoft is a pictorial representation of the cloud models and the control that each model gives the user. 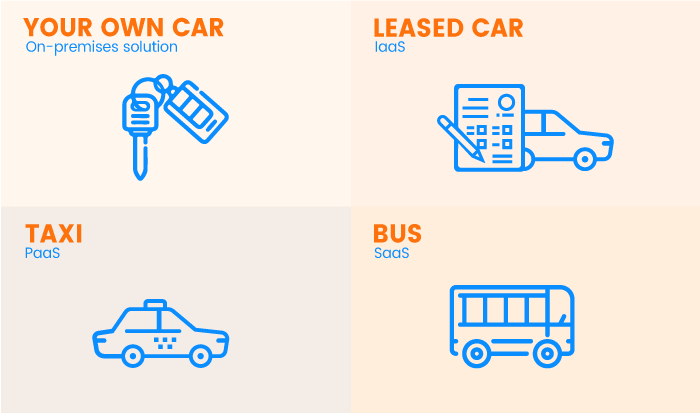 We hope you’re able to make a decision on which model to choose for your business. Do note that it can be more than 1 model as well. You could use SaaS products for Project Management but might also require IaaS or PaaS to build an application altogether. If you have any questions, feel free to reach out to us in the comments section below.